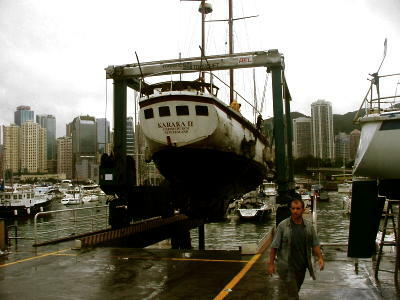 Karaka is an old ship that I found abandonned in Hong Kong in june 2004. She was sitting rotting away in Causeway Bay Typhoon Shelter on Hong Kong Island. I saw the boat when first arriving in Hong Kong on a delivery from Australia. I was actively looking for a boat at that stage but it took me about a month to decide myself to risk it with this old rusty tub. She was not looking too good, and there was a notice on her side for removal. I finally managed to get in contact with the owner a few days before the boat was going to be sent to the scrapeyard and he agreed to give her to me, that is, sold for one symbolic Hong Kong dollar. 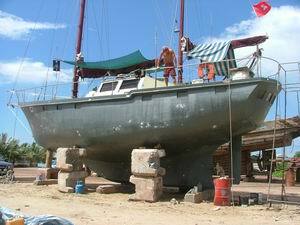 The boat herself is made of steel, with a nicely shaped round bilge full keel. The plates on the hull are 6mm thick and on the deck 5mm. She is 52ft (16.5m) overall, 48 ft on deck, 15 ft(4.5m) beam. 42 ft waterline. The draft is 7ft (2m). She weights between 25 and 30 metric tons depending if the tanks are full or not. 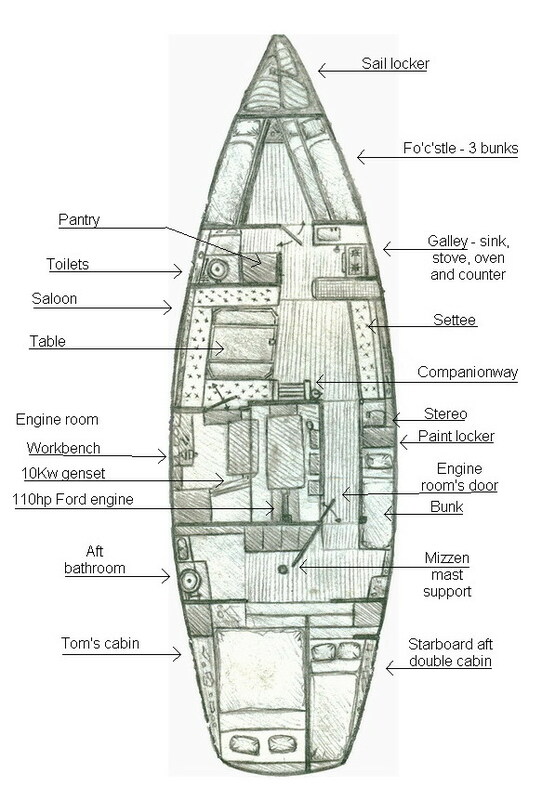 She got center cockpit, with pilothouse, and is flushdeck, which means huge areas to lie around. The poop deck got a table and bench, a sunset drink dream come true. Karaka was built in in New Zealand by an Auckland mecanic, in his garage. It took him 12 years and he definitly put a lot of attention to built a strong, well made boat. He spent too much on material apparently since he sold the boat to a family of 4 before completion in 1976. They finished her and went cruising. They took the boat from New Zealand to Australia, up toward Singapore, across the Indian Ocean and up the Red Sea and into the Med. They then did a refit in England, sailed across the Atlantic to the Caribean, crossed the Panama canal and then sailed home to New Zealand through the Pacific in 1987. Once back home they exchanged the boat for a farm property in Australia. The second owner took her to Fidji and to Australia. She won the Auckland to Melbourne race in the cruiser class in 1988. 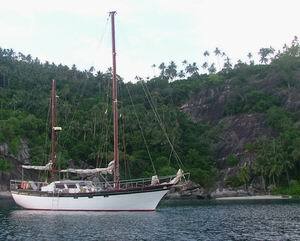 The first owners, who by then had set up a brokerage company, arranged the re-sale of Karaka to a New Zealand family of 5 in 1992, who then took her north to Hong Kong through Papua New Guinea and Micronesia. 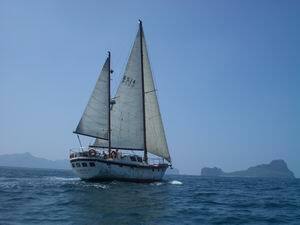 They lived on board in Hong Kong for five year and then moved to Phuket in Thailand, letting the badly maintained boat to rust in the Royal Hong Kong Yacht Club. They had the idea of refitting her sometime, but the Hong Kong port authorities threatened to demolish her in 2004 before the owners could muster time money and will to come back to give her a new life. I saw the boat in the marina after sailing from Australia and noticed the warning for removal placarded on her side. I enquired and instead of letting his boat go to scrape, the previous owner kindly decided to let me have it for free. The name of the place she was built was Karaka, which I guess is part of the reason the first owners gave her that name. Karaka is also the name of a tree endemic of New Zealand, a wide spread maori family name meaning the color orange, and several other meanings all over the world, one interesting beeing this one : KARAKA (KHA-RAH-KHA – a word that probably comes from the Arabic “karrâka”, meaning easy Vessel; English – carrack, French -carraque, Dutch – kraeck, Spanish – carraca, Italian – caracca) is a large sailing vessel used between 14-17th century, and was intended for cargo transport. 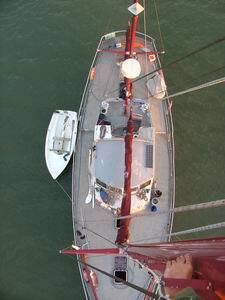 She is a ketch so got two masts, the smaller one beeing the aft one. Usually we set 3 sails when underway. She is very well designed and is quite fast for a big fat boat, and quite easy to handle, 2 experienced people is enough for any passage. 8 crew living on board would be the top limit for comfort. 5 or 6 is ideal. For the sailing particulars, refer to the “sailing” page. Living quarters are roomy, more than usual on a yacht, as she has a higher than usual freeboard and a lot of volume aft. 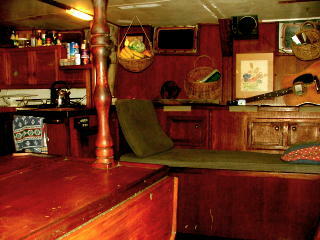 The galley is adjacent to the saloon so the cook doesn’t feel left out when cooking. Bunks are spread a little all over. There isn’t much privacy, but not less than on any other boat. The engine room is huge with a fully equipped workshop and a big diesel generator in addition to the 110HP Ford engine. There is a lot of storage place.